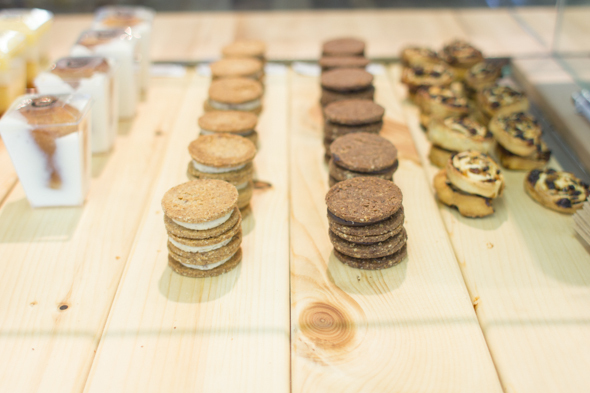 Forno Cultura is fresh goods on Toronto's baking scene. 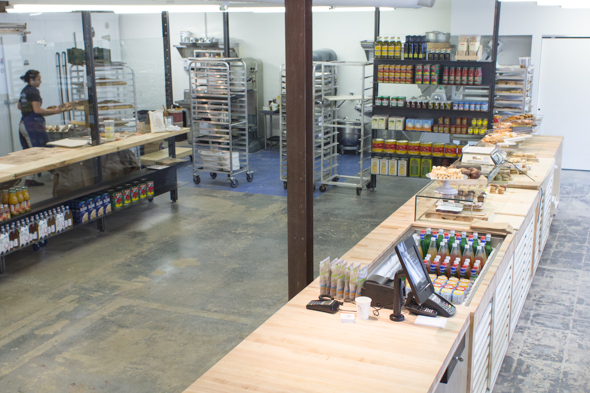 The Italian bakery opened two weeks ago at King and Bathurst in a warehouse-like space beneath WVRST . 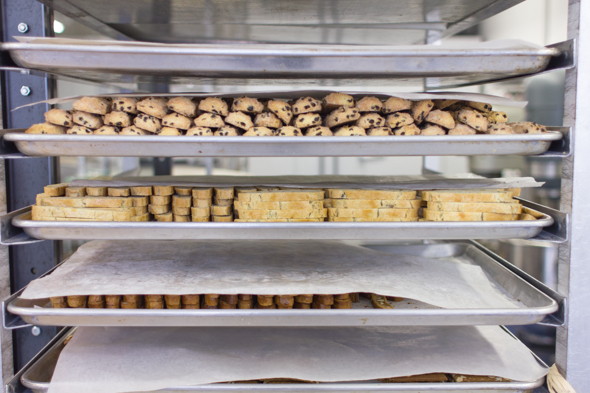 While the bakery has an uber-modern aesthetic, owner and creator Andrea Mastrandrea's business model is based on old family recipes going back generations. The space has bare concrete floors, and the exposed piping is painted stark white. 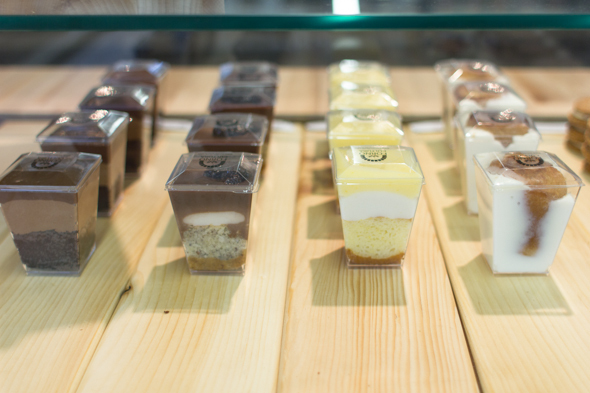 There's simple wooden shelving around the periphery of the bakery, and in front of a glass wall behind which the chefs make their magic. 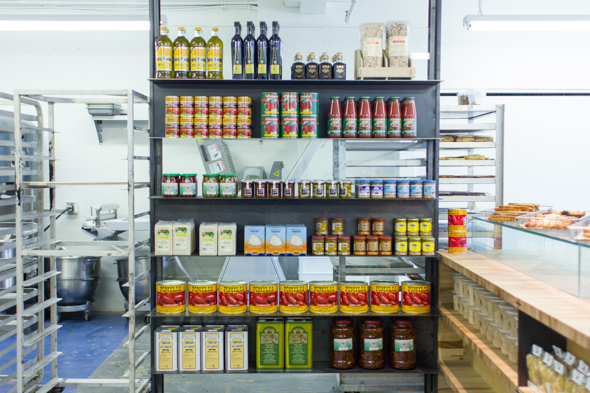 The shelving is stocked with olive oil, balsamic vinegar, Italian peeled tomatoes, mineral waters, and tuna. If I were a nonna , it's where I would go to buy supplies to make dinner for my astronomical number of grandchildren. Interestingly, though, Mastrandrea's recipes are passed down from his father and his grandfather, not his grandmother. His family still operates Aida's Pine Valley Bakery in Woodbridge. Mastrandrea grew up in the family business, which used to be located at Weston and Rogers, but it wasn't his first career move as an adult. He's trained as an architect, and worked in that field for years, but at some point he started to miss the Italian food he and his friends grew up on. "I realized it didn't exist anywhere. I was complaining with colleagues, and I thought, 'let's stop complaining and just do it.' It'll be a dying breed if we don't put it back on the market." Though the King and Bathurst location is new, Mastrandrea has been in business for a few years. He operated out of Alimento , and he's got a kitchen near Queen and Carlaw, too. But I have to say, I'm happy he's expanded. Mastrandrea is a true creative in the kitchen. As we chat over the front counter, he fills me in on his carbilicious inventions. 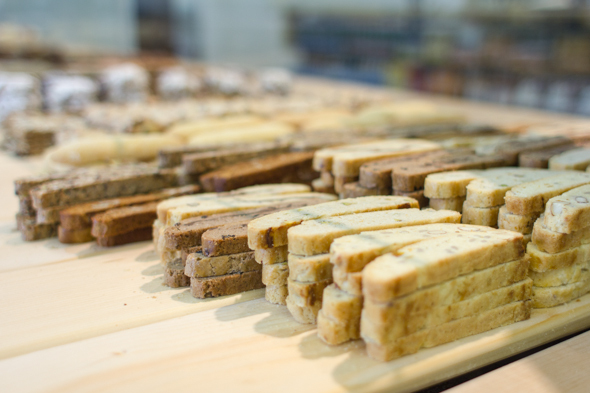 There's a tomatoey foccacia I can't stop eyeing, loaves of olive bread, a bazillion kinds of biscotti with ingredients like seeds, almonds, and chocolate, and so many other different kinds of bread: cornbread, sourdough, and loaves with spices and walnuts. Mastrandrea ensures me that everything he bakes is free of white flour and artificial flavouring. Instead, he uses ancient grains, organic flour and ingredients imported from Italy. "I want people to say, 'This tastes like something my grandma made,'" he explains. As he gives me the deets, Mastrandrea selects a series of delectable treats for me to try. He's invented the most incredible dessert-like item I've yet to discover. It is a fist-sized mini-cake with a chocolate base, but not too sweet at all. Inside, there are semi-sweet dark chocolate chunks and sundried black olives . 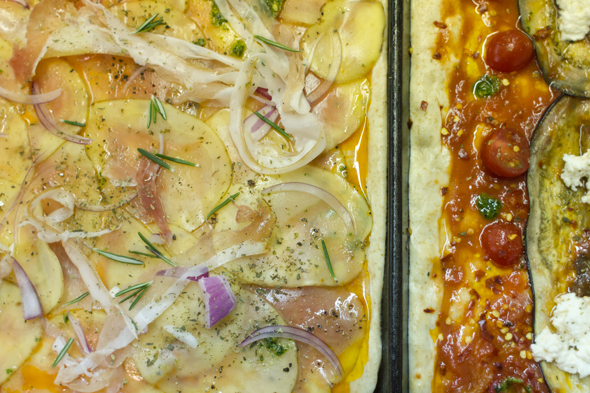 The sweet and savory contrast is a definite worlds-colliding moment, but in the best way . It's like an especially fancy chocolate bar with sea salt, only a million times better. I take home a box of treats to my roommate, and tell her that the opportunity to sample them is contingent upon her prompt and amusing delivery of a review. She stuffs an almond cookie in her mouth and her eyes actually bug out. "Ooooohhhh......" she says, speechless, and keeps eating, ignoring my demands for further feedback. It's a rave review, if I've ever heard one. To be honest, it's hard to find anything to scathingly critique when it comes to this place. It's one of the good ones. My one minor issue is that there's no seating. 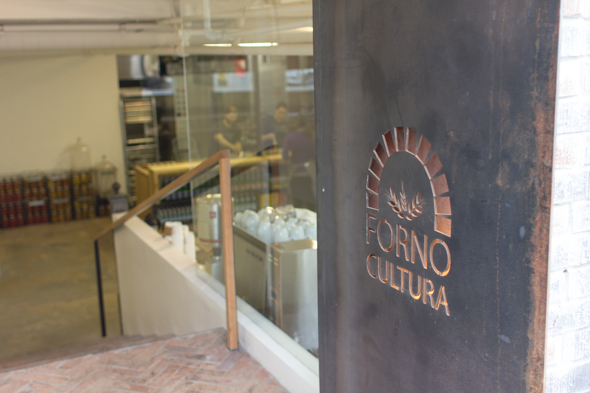 Forno serves coffee as well, and it would be nice to be able to sit down and relax with some coffee and a treat. They have the space for it, so hopefully they'll implement that in the future. My other, more significant complaint is that this place is right next to my yoga studio, and I fear it will completely undo the effects of my classes in a matter of weeks. And just in time for summer.